You can also read the article at Podiatry Management Online here. Wound pain has numerous, often interlinked, causes that may relate to the initial injury, the inflammatory response or infection. Pain may also result from interventions, such as dressing removal, cleansing, debridement, compression therapy, or topical treatments. Pain as a result of trauma, particularly during the dressing change procedure, has been described by patients as the worst part of dealing with a wound. Though pain control is often the patient’s primary concern, clinicians are more likely concerned with wound healing and the prevention of infection. Wound infection is one of the most challenging aspects of wound management and a major contributor to healthcare costs globally., Wound infection is a complex process that results from a detrimental interaction between the patient and the pathogen(s) that can delay healing and cause and amplify wound pain. The main underlying cause of infection-related wound pain is the inflammatory response stimulated by the infecting microorganisms. This response causes the release of inflammatory mediators and stimulates the production of enzymes and free radicals, which can cause tissue damage. Pain may result from direct stimulation of peripheral pain receptors by the mediators, from tissue damage, and from the swelling that occurs as part of the inflammatory response. The inflammation and cell damage may also increase the sensitivity of the pain receptors and central nervous system, so increasing the overall perception of pain and utilization of pain medications. Wound infection, especially when associated with Staphylococcus aureus and Streptococcus pyogenes is a major concern for healthcare providers. In a recent surveillance report most methicillin-resistant S. aureus (MRSA) infections were nosocomial: 58.4% were community-onset infections, 26.6% were hospital-onset infections, 13.7% were community-associated infections, and 1.3% could not be classified. Community-acquired MRSA rates as high as 60% have been reported in patients with skin and soft-tissue infections. Additionally, alarming is the fact that clinical studies have shown that antibiotics are often ineffective against MRSA infections. Astero™ is a topically applied medicated prescription hydrogel indicated for painful wounds including post-surgical incisions, cuts, abrasions and ulcerations that should be considered a first line treatment for these types of injuries. Astero™ is an FDA approved combination of long-proven hydrogel, enhanced with Meadowsweet and Oak Extract, and the well-known topical anesthetic Lidocaine in a 4% concentration. This unique medication is manufactured by Gensco Pharma in a cGMP and FDA-regulated pharmaceutical manufacturing facility, guaranteeing quality and consistency. 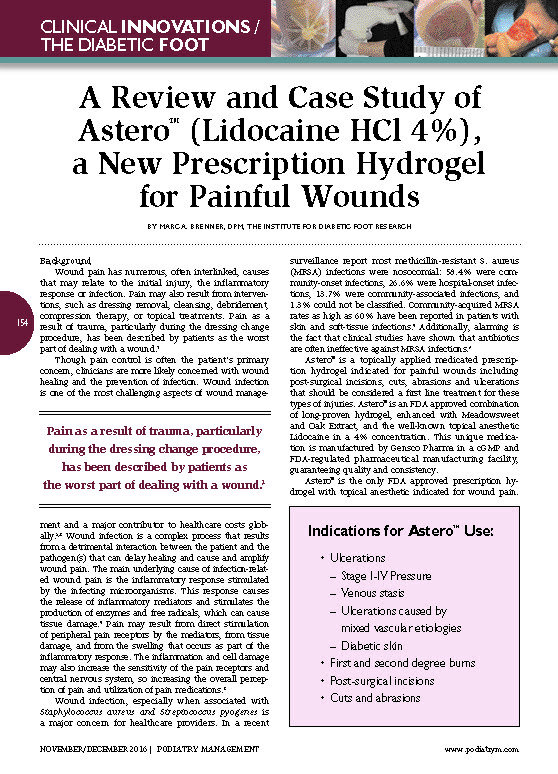 Astero™ is the only FDA approved prescription hydrogel with topical anesthetic indicated for wound pain. Astero™ is specifically formulated to create a moist healing environment, which promotes granulation, epithelialization, and autolytic debridement, while providing prolonged anesthesia of the wound, lessening the need for systemic pain medications including opiate-based drugs. PK is an 84-year-old white male who is overweight and long-term diabetic who has pedal pulses ++ right foot and pulses left +. He has a history of wearing no socks and gardening two days ago with new tight shoes. PK has now presented with two large dorsal lesions, one necrotic and lengthwise 2” and the smaller lesion blistered and filled with fluid. In addition, he also has onychomycosis on 5 of his 10 nails, mainly affecting his hallux digits. The treatment plan includes daily cleaning with diluted Betadine® solution and the application of one metered dose pump (0.25 mL) of prescription Astero™ and DSD. Patient’s foot was then inserted into an open-toe wooden post-operative shoe. Patient returned to clinic one week later and has experienced very good clinical results and wound healing. Patient reported pain on weight bearing the first day. After one week, no pain was felt on the weight bearing. Astero™ provides the clinician a proven and trusted first-line wound dressing for patients with painful wounds who are also diabetic. The soothing hydrogel containing Meadowsweet and Oak Extract creates a superior wound healing environment while the lidocaine component imparts sustained pain control of the wound. Dr. Marc A. Brenner is a past President and Fellow of the American Society of Podiatric Dermatology. He is a renowned national and international lecturer in the areas of podiatric dermatology and diabetic foot salvage. Dr. Brenner is the editor of the textbook Management of the Diabetic Foot. He is currently on the medical staff of North Shore University Hospital and Long Island Jewish Hospital, and has private practices in Glendale and Lake Success, New York. Dr. Brenner has served as a consultant and member of the Gensco Pharma Medical Advisory Board. White, RJ. Wound infection associated pain. J Wound Care, 2009; 18(6): 245-49. Harding K, Renyi R. The International Wound Infection Institute—a new global platform for the clinical management of infected wounds. Int Wound J 2009; 6(3): 175-78. Crum NF, Lee RU, Thornton SA, et al. Fifteen-year study of the changing epidemiology of methicillin-resistance Staphylococcus aureus. Am J Med. 2006;119(11):943–951. Brenner, Marc A. Management of the Diabetic Foot, 1987; Chapter 9, p. 110-19.